 FM Approvals has been made aware of automatic fire sprinklers found in Malaysia bearing a counterfeit FM Approvals mark. FM Approvals has neither tested nor certified this product. The sprinklers bear the marking “VIKING” on the wrench boss and the Viking SIN “VK100” on the deflector but the identity of the manufacturer is unknown. 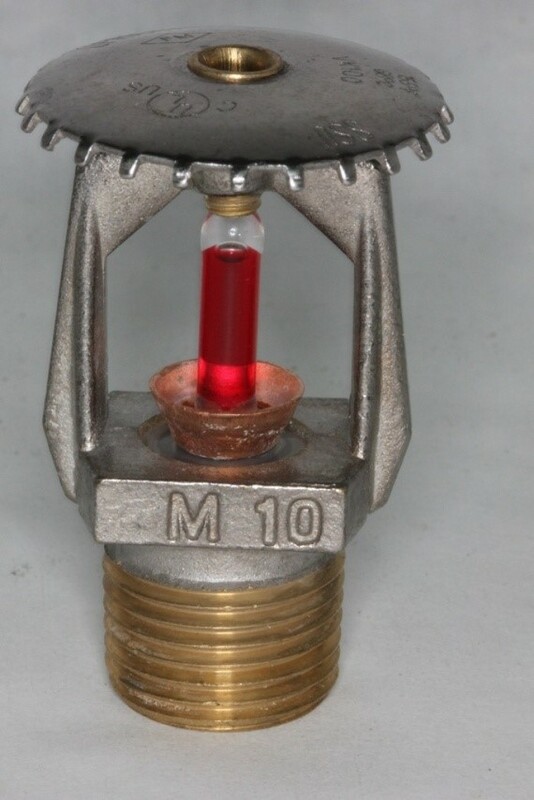 These automatic sprinklers cannot be relied upon to react to or control a fire. Failure by any of the following mechanisms is possible: failure of the thermal element, orifice leakage, premature or delayed operation, bulb strutting (incomplete fracture), ejection of the deflector, inadequate or excessive discharge rate, corrosive attack, failure to operate, failure to produce an adequate discharge pattern, etc. The sprinklers were not produced by the Viking Corporation. Figure 1 shows a comparison of the frame of the sprinkler identified as counterfeit to the frame of an authentic Viking VK100. The new VK100 uses a frame noticeably different in shape. The “VIKING” marking is no longer applied to the wrench boss of new authentic sprinklers, instead only the letters “VK” appear. 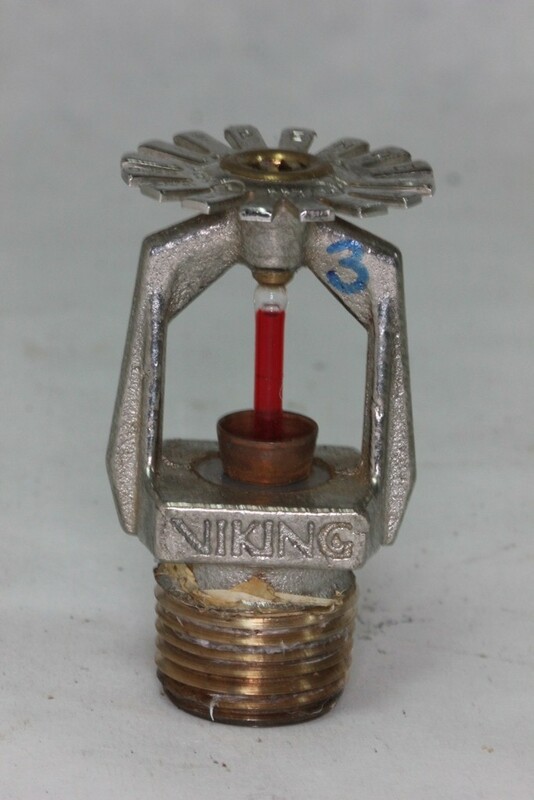 Also shown is an older authentic Viking sprinkler after which the counterfeit sprinkler appears to be modeled. There are greater similarities in the shape of the frame. 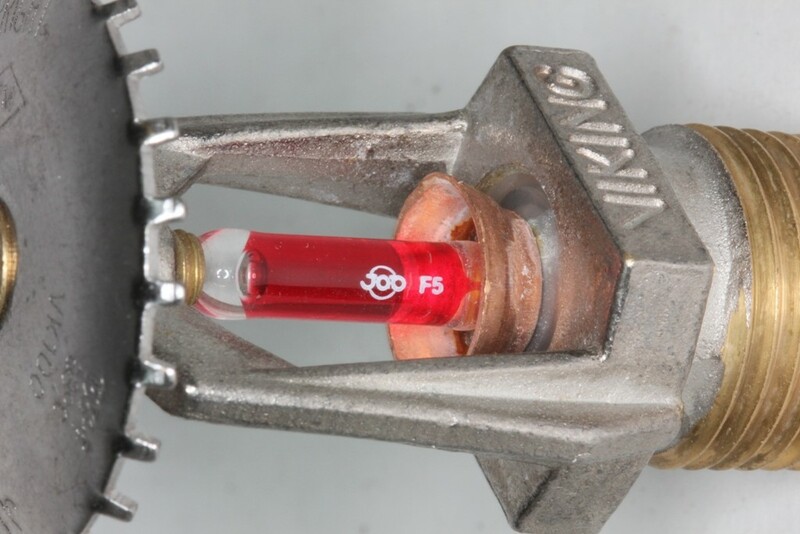 The font used for the wrench boss marking differs between the counterfeit and authentic sprinklers. The counterfeit also has a lower luster chrome plating with a smoother appearance. 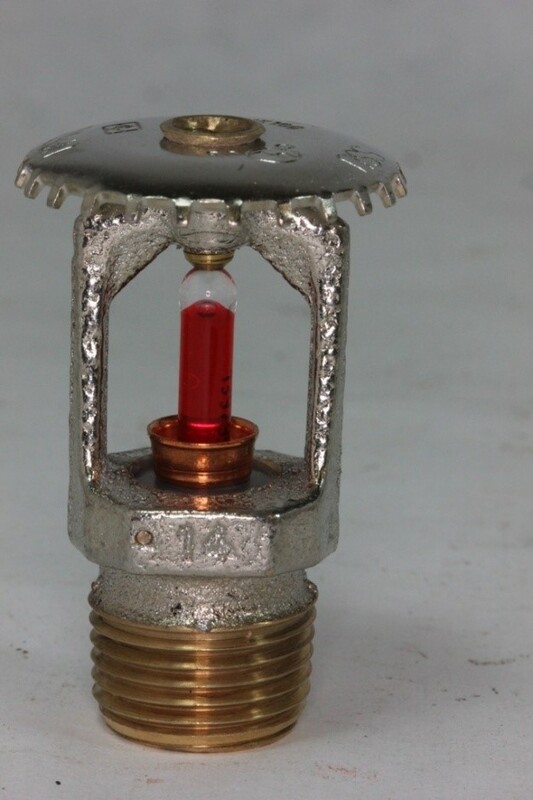 The rougher appearance of the authentic sprinkler frame is thought to be due to the sand casting process used to produce it, while the counterfeit appears to be a forged/pressed piece. The yellow arrows in Figure 1 show the protrusion of the tip of the load screw used to impart force on the orifice seal. 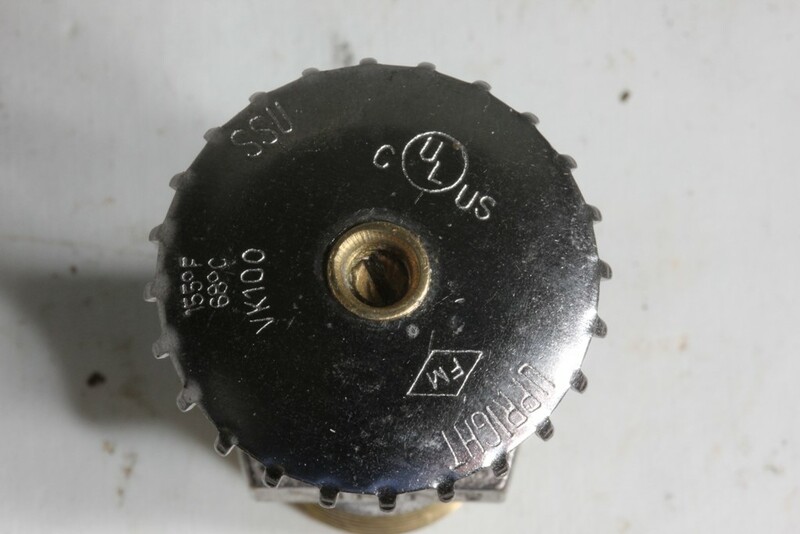 The load screw used in the counterfeit has threads cut down to the tip where it contacts the dome of the glass bulb. 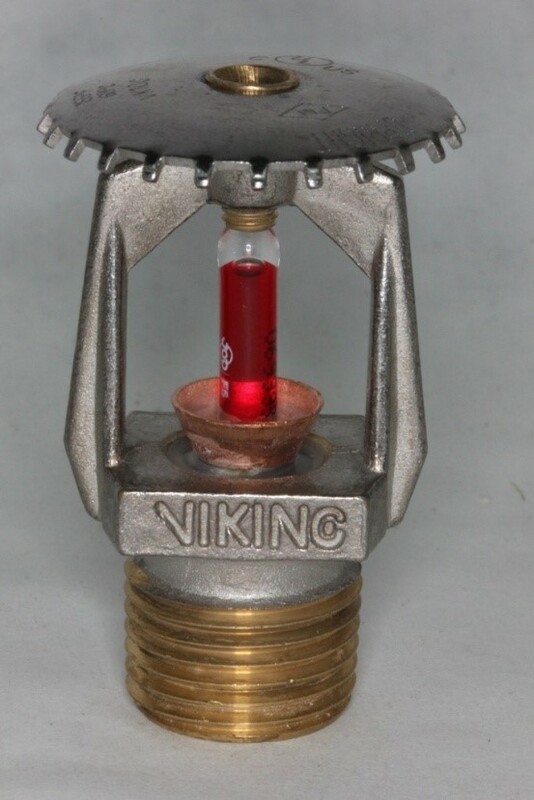 In both versions of the authentic Viking sprinklers, the load screw has a taper in the last one to two millimeters of length. Figure 2 shows the opposite sides of the three sprinklers pictured in Figure 1. 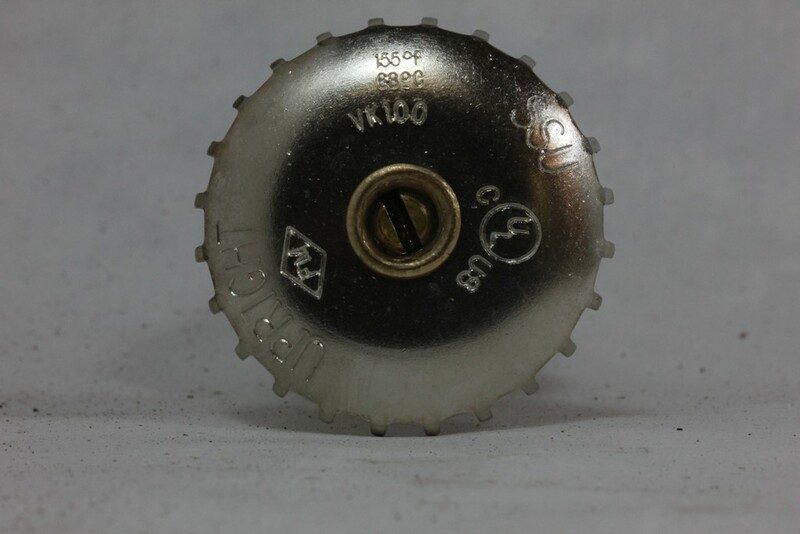 The wrench boss marking on the new authentic Viking frame only shows the two digit year of manufacture “14” and drops the previously used model series designation “M.” The counterfeit sprinkler uses a marking scheme very similar to the older authentic Viking sprinkler. 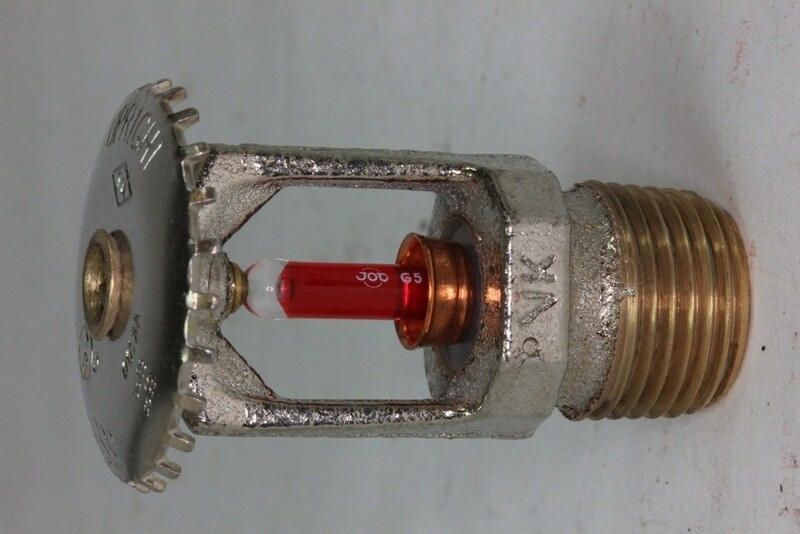 Figure 3 shows close views of the glass bulbs used in the counterfeit sprinkler (left) and an authentic Viking VK100 sprinkler (right). 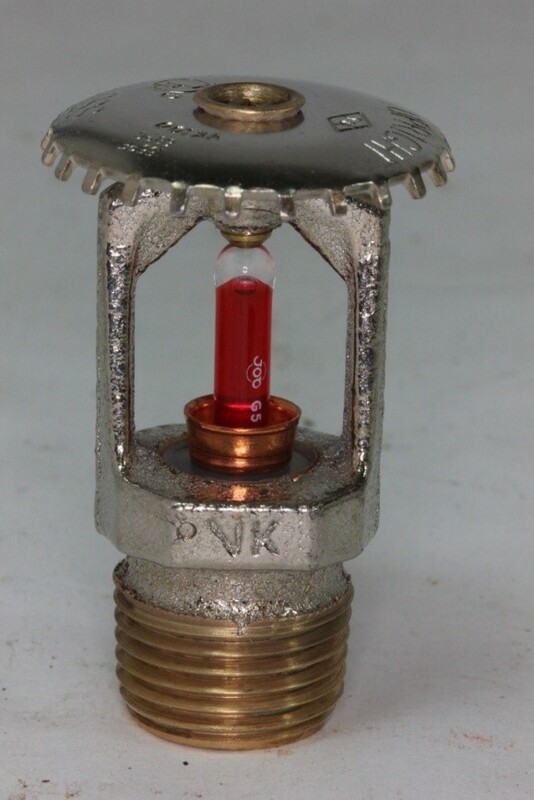 The counterfeit sprinklers obtained use Job F5 5mm diameter glass bulbs, while authentic Viking VK100 sprinklers only use the Job G5 bulb. Figure 4 shows a comparison of the deflector markings on the counterfeit sprinkler (left) and an authentic Viking VK100 sprinkler (right). 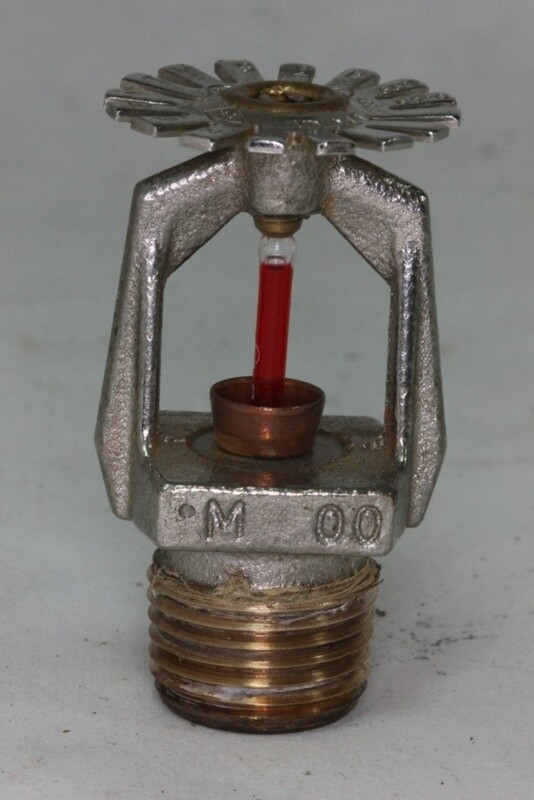 The content and position of the markings on the counterfeit sprinkler are very similar to authentic sprinklers. The only discernable difference is in the font type used. The counterfeit FM Approvals marking can be seen in the lower right quadrant of the left photograph, highlight by the yellow arrow.